Pecan – How Do You Say This Word? Pecans have been a hot topic in the news within the last few years and rightfully so. This versatile nut ranks highest among all nuts in antioxidant capacity. Pecans contain more than 19 vitamins and minerals – including vitamin A, vitamin E, folic acid, calcium, magnesium, phosphorus, potassium, several B vitamins and zinc. One ounce of nutrient dense pecans provides 10% of the recommended Daily Value for fiber. From lowering cholesterol to helping fight diseases like Alzheimer’s and Parkinson’s to enjoying pecan pralines, nothing compares to the pecan! Below is portion of an article from http://farmflavor.com/how-do-you-say-pecan-mapping-food-dialect-trends-across-the-u-s/ow for you to enjoy. It shows that pee-KAHN is dominant nationwide, but in areas of Texas, Oklahoma, Louisiana and Mississippi, pick-AHN reigns supreme. PEE-can is popular on the East Coast and in New England, while folks from Wisconsin, northern Minnesota and Michigan’s Upper Peninsula go with PEE-kahn. 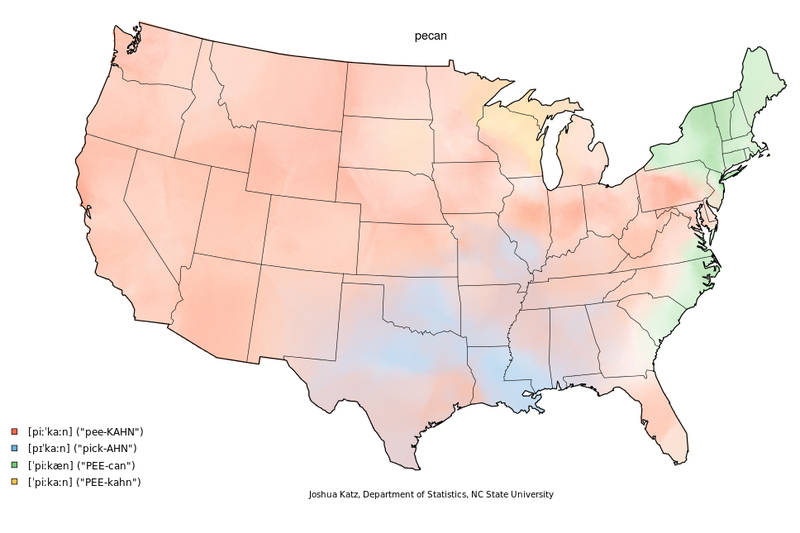 The linguistics department at the University of Wisconsin-Milwaukee just also shared a pecan pronunciation map that gives another option – where people may say pee-KAHN by itself, but then say PEE-can when using a compound word, like pecan pie. So again – How do YOU say pecan? Leave us a comment…. Filed Under Uncategorized | Tagged pecan, pecan pralines. Bookmark the permalink.